The Glade in Home Wood stretches down from the neo-Palladian house (Exbury House) that Lionel built around the smaller 18th century house. 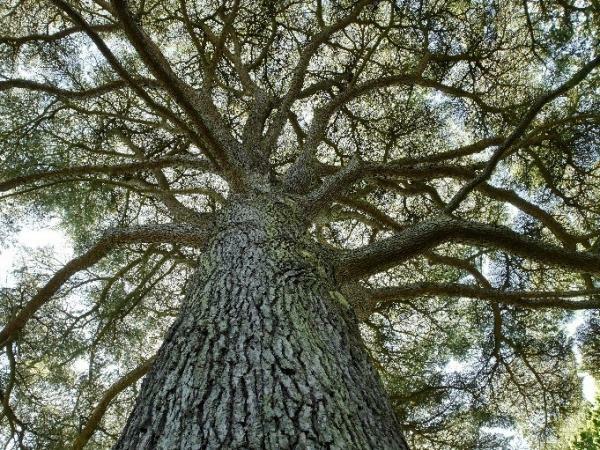 It is marked by a number of magnificent Cedars of Lebanon, planted in 1738 and a very tall Sequoiadendron gigantenum, the giant redwood from the U.S. Pacific Coast. On a nearby Oak tree hangs a Burmese temple bell, possibly brought back from the First Burmese War in the 1820s by Captain Marryat, who later wrote The Children of the New Forest; it hung in the Rothschild family home of Gunnersbury just outside London till Lionel brought it down to his new garden at Exbury. Near the bell is a planting of hybrid rhododendrons including, amongst others, the beautiful unblemished pink Rhododendron ‘Charlotte de Rothschild’, named after Edmund’s younger daughter. An oriental plane tree had been cunningly layered to snake out as a climbing tree. One flank of the Glade has the Bridal Walk, a stunning study in red and white with the white evergreen azalea R. ‘Palestrina’ flanked by Rhododendron ‘Ivery’s Scarlet’. The Home Wood paths are usually at their best around late April and early May, when rhododendrons such as the delicate ‘Dairymaid’ or the golden yellow ‘Duchess of Rothesay’ are resplendent. 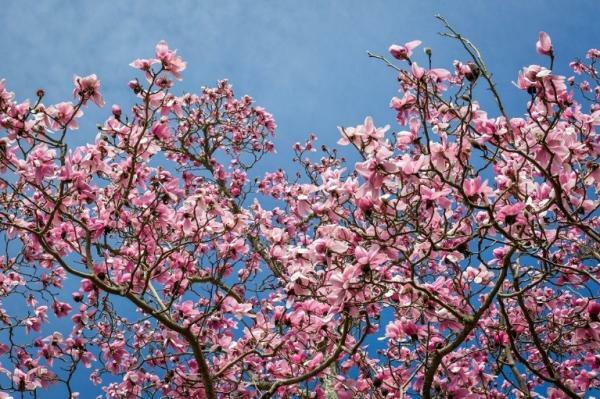 There is also a magnificent collection of magnolias, including the lofty Magnolia cambellii. Later in May the dogwoods light up the path with their creamy white and pink bracts. By the crossroads grow a bank of lemon yellow Rhododendron ‘Hawk Crest’. In this plant Lionel realised his quest of creating a flower of absolutely pure yellow, although he did not live to see it. Also at the crossroads is the compact Rhododendron yakushiamanum, whose deep pink buds mature into delightful pure white flowers. Many beautiful Exbury hybrids line the way to St. Mary’s Spring, where ‘Mrs. Lionel’s Seat’, overlooks the bog primulas, ferns, giant Gunnera manicata (not a relative of rhubarb) and various forms of pieris. The stream from the spring then passes under the Japanese Bridge to Top Pond, where carp and golden orfe swim lazily about as well as several varieties of duck. Damselfly hover around the primulas and iris at the water’s edge. The little island is shared by swamp cypress Taxodium distichum, and the late May flowering Rhoddodendron ‘ Purple Splendour’ whose deep colour complements the rich dark foliage of the copper beach opposite. A full display of Exbury and Solent deciduous azaleas surrounds the pond with fiery colours. These same leaves shade a small waterfall which splashes into a series of pools, beside which grow Japanese maples, candelabra primulas and hostas. 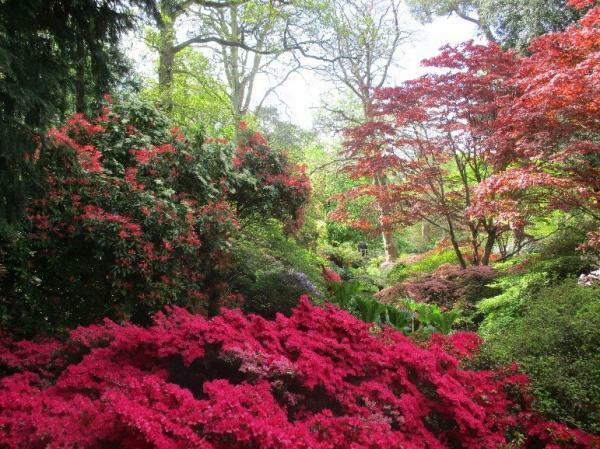 It faces the Azalea Bowl (formerly the Wyniatt Bowl, named after the post-war head gardener Freddie Wyniatt), with its fine display of evergreen azaleas, whose reds, shocking pinks, fuschias, mauves and whites can almost be described as outrageous. This tapestry of colour also extends around the Lower Pond where a collection of the Wilson 50 azaleas from Kurume can be found.